IN ORDER TO CONSIDER THE USER EXPERIENCE OVER LONGER PERIODS AND ALSO LOCATIONS OFF OUR TEST ROUTES AND PLACES, THE RESULTS OF CROWDSOURCING ANALYSES ARE INCLUDED WITH 15 PER CENT IN THE OVERALL EVALUATION. We have filtered a small number of outliers with conspiciously good results from our crowd evaluation as we could not absolutely exclude the suspicion of fraud. Further details about this can be found here in the section “Fairness and Transparency”. 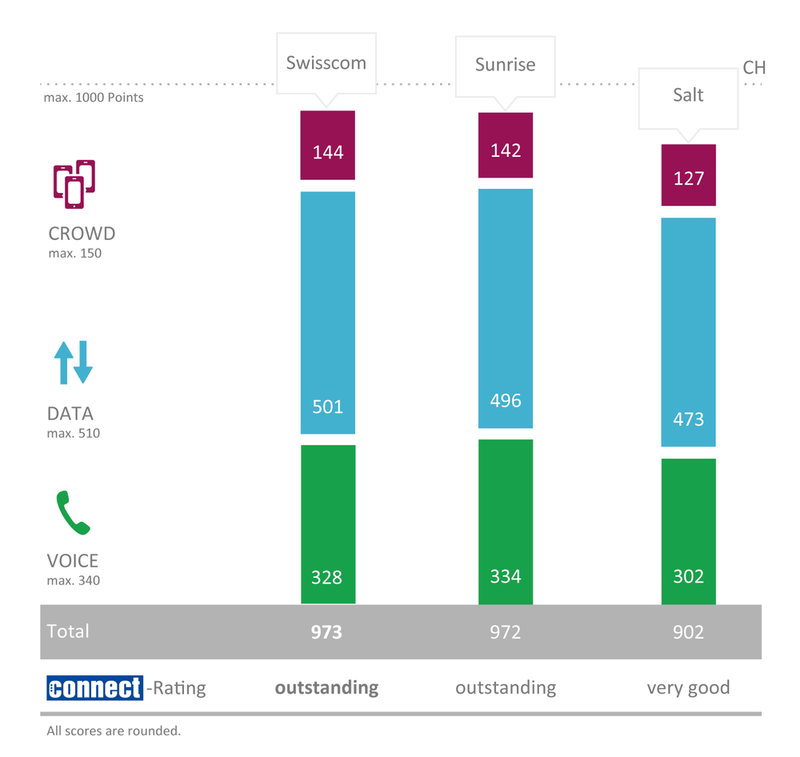 High values for the crowdsourced network coverage for voice and 4G once more emphasise the good network performance in Switzerland. Also the “quality of coverage“ (how often the customers could have actually used a respective network technology) is pleasantly high. Swisscom shows somewhat higher top values for the effectively achieved data speeds. Here, Sunrise and Salt are on a par, but behind Swisscom. For „Data Service Availability“, we have extended the observation period to last from May until November 2018. Here, Sunrise shows a convinding zero observed degradations. In the Swisscom network, we identified only one event with a length of up to one hour in August 2018. In the Salt network, we recognised degradations on eight days over a total of 22 hours in the Salt network. DUE TO CHANGES IN THE METHODOLODY AND WEIGHTING, THIS YEAR‘S SCORES ARE NOT DIRECTLY COMPARABLE WITH LAST YEAR‘S RESULTS. NEVERTHELESS, SWISSCOM AND SUN¬RISE MAINTAIN THEIR HIGH PERFORMANCE LEVELS. SWISSCOM CROSSES THE FINISH LINE WITH A RAZOR-THIN LEAD. SALT WAS ABLE TO IMPROVE CONSIDERABLY.